ALS patients with postural instability exhibit impaired gait initiation with an altered APA phase, poor dynamic postural control and significantly decreased braking index. 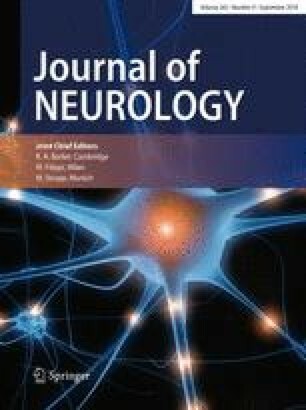 Consistent with their clinical profile, “unsteady” ALS patients have reduced caudate and brain stem volumes compared to “steady” ALS patients. Pierre-François Pradat and Giovanni de Marco contributed equally to this work as senior authors. Maryse Feron and Annabelle Couillandre contributed equally to this work as first authors. The authors are grateful for the generosity and kindness of all participating patients and healthy controls. We also thank Xavier Devrelle, Sophien Mehdi, and Sara Fernandez-Vidal (ICM Foundation) for their assistance in data recording. We thank the Center for Clinical Investigation (Instititut du Cerveau et de la Moellle Epiniere, Paris, France) and Vanessa Brochard for their role in the organisation and management of the study. This study was funded by a grant from the Association for Research on ALS (ARSLA) and the Institut National pour la Santé et la Recherche Médicale (INSERM). The research leading to these results has also received support from the programme ‘‘Investissements d’avenir’’ ANR-10-IAIHU-06. The authors have no actual or potential conflict of interest to disclose, including any financial, personal, or other relationships with other individuals or organisations within 3 years of beginning the submitted work that could inappropriately influence, or be perceived to influence, their work. Marie-Laure Welter received research support from the ‘Institut du Cerveau et de la Moelle. Epinière’ (ICM) Foundation and the Agence Nationale de la Recherche. Nicolas Termoz received research support from the Laboratoire CeRSM—EA 2931. Peter Bede is supported by the Health Research Board (HRB—Ireland; HRB EIA-2017-019), the Irish Institute of Clinical Neuroscience IICN—Novartis Ireland Research (IICN—2016), the Iris O’Brien Foundation, the Perrigo Clinician-Scientist Research Fellowship, and the Research Motor Neuron (RMN-Ireland) Foundation Ireland. Pierre-François Pradat received research support from the French Association for Research in ALS (ARSla), the Institute for Research in Spinal Cord and Brain (IRME), the French Association for Myopathie (AFM-Telethon), Paris Institute of Translational Neuroscience (IHU-A-ICM), the Thierry Latran foundation, the Target ALS foundation and the Institut National pour la Santé et la Recherche Médicale (INSERM). Giovanni de Marco received research support from the Laboratoire CeRSM—EA 2931 and COMUE Université Paris Lumières. All procedures performed in this study were fully approved by the local, institutional ethics committee (CPP Ile-de-France Paris VI; INSERM promotion RBM C12-13) and were in accordance with the 1964 Helsinki Declaration and its later amendments. This study does not involve any methods or experiments with animals. All study participants provided informed consent prior to inclusion in the study.